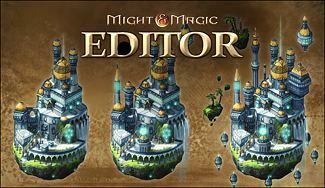 This H7 Editor article series is designed for players who wish to create their own maps for Might & Magic: Heroes VII. The editor has an in-depth manual included, but in this guide we give you a quick introduction on how to begin making your own maps. If you’ve ever created a map to a previous Heroes game, you’ll find the Heroes VII map editor already quite familiar. Although the game engine is entirely new, core elements of the editor remain the same. And if you’re creating a map for the first time, our guide will help you to get started. The Heroes VII editor consists of the basic mode (which you see when opening the editor for the first time) and the advanced mode (also called the “Unreal editor”). In the advanced mode you can access more advanced customization possibilities, such as creating your own units or even entire factions. You can switch between the two editor modes freely when editing a map, however this article will get you started on the basic mode functions. You can launch the editor from the Uplay client, under the same button as the MMH7 game itself. Just select “Might and Magic Heroes VII Editor”. Loading the program can take several minutes, even on a fast computer. After loading the program, you will see the surface of a generated base map (1), lighting icon (2) and wind icon (3). On the left are tool panels for editing terrains and objects (4). On the top toolbar (5) are all the general options for editing, and on the bottom left corner (6) you can see the current minimap (refreshes automatically when you switch tools). The green grid shows the surface where the heroes can move. The color of the grid may change depending on the surface texture and square availability. This is where you drag & drop objects from the tool panels, and select and modify them. To rotate the camera, hold the right mouse button and move the mouse. You can zoom in and out with the mousewheel and move with the WASD keys. Let’s take a closer look at the top toolbar. New map Open the new map window to create a new adventure map, random map or a combat map. Open… Open an existing map. Save Save the current map. Undo Undo the last action (shortcut: CTRL+Z). Redo Redo the last undone action (shortcut: CTRL+Y). Cut Cut the selected object (shortcut: CTRL+X). Copy Copy the selected object (shortcut: CTRL+C). Copy Paste the copied object (shortcut: CTRL+V). Selection mode Select an object on the map. Translate Move the selected object along X, Y and Z axes. Rotate Rotate the selected object. Scale Scale the selected object. Camera speed Set the camera panning speed. Toggle Camera Mode Toggle the camera mode between 2D and 3D. Toggle Grid Visibility Toggle the visibility of the grid and markers. Script Tool Open the script editor to create events. quests, dialogues and in-game scenes. Campaign Tool Open the campaign tool to combine multiple maps (up to 7) to a campaign. Artifact Tool Open the artifact tool to create custom artifacts. Hero Tool Open the hero tool to create custom heroes. Object Browser Modify the basic settings of game objects. Map Properties Define general map settings, player options, weekly events, heroes, items and win/loss conditions. Toggle surface/underground Switch between the surface and underground level. Note: You need to create an underground level in the Map Properties first. Publish current Map Publish (or “cook”) your map file into My Games\Might & Magic Heroes VII\MMH7Game\CustomMaps\. Help Open the editor documentation. Unreal Editor Switch to the advanced mode, Unreal Editor. Most of the main menu commands can be found as icons in the top toolbar. The most important exceptions are the camera setting (View -> Use In-game Camera Controls), setting the autosave (Tools -> Autosave Interval) and texture quality (Performance -> Texture / Landscape quality). Now let’s look at the tools for creating different terrains and placing objects on the map (the left panels). Textures Terrain painting. Apply different textures to the surface (grass, snow, desert, water, lava…). Paint Areas of Control, assign areas to combat maps and define passability to tiles. Height Sculpting Edit the height of the landscape. Create hills, cliffs and water. Foliage Paint trees, flowers and other decorative objects. Player Buildings Place towns, forts, mines and dwelling buildings. Neutral Buildings Place all kinds of interactive buildings for heroes to visit. Heroes Place either random or specific heroes. Creatures Place either random or preset creature stacks. Artifacts Place either random or preset artifacts. Pickups Place campfires, chests, resources and other objects for heroes to gather. Props Place decorative, noninteractive objects. Ambiance Place special atmospheric effects such as rain or fog. 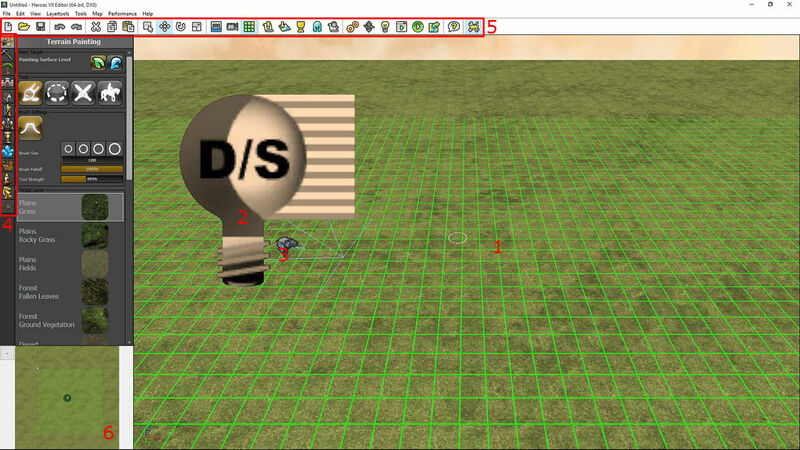 Editor Objects Triggers, grid markers and other editor related objects. Combat Map Objects Decoration and obstacles for combat maps. To wrap up this first part of the editor guide series, here are a few useful things to know before starting your first map. You can disable the autosave from Tools -> Autosave Interval -> uncheck Autosave Maps. This can be useful since it’s very easy to make the map unplayable by accident. You can copy or duplicate already existing objects with CTRL+C, CTRL+V and CTRL+D. The copied object is placed directly on top of the original, so you need to move it with the Translate tool. Think twice before choosing which type of map you want to create, a scenario or a skirmish. A scenario map can contain scripts, quests and story while a skirmish map is simply for a competitive game. Test your map thoroughly and send it to friends for playtesting before sharing it to a bigger audience. “Cooking” is a term used by the Unreal Editor. A “cooked map” means the map is finished and compressed, and ready for sharing. Cooked maps (= published maps) cannot be edited. In Part 2 we’ll begin our first scenario map and create terrains, erect mountains, flood a valley with water and burn underground with lava. Have fun with the editor and see you soon! When you switch to unreal editor you can change at any moment type of map so you can make scripts in scenario and later change it to skirimish – scripts will work. how can we “uncook” a map we downloaded from this website if so we can tweak the map to our liking? The reason i ask is because i don’t have the time to master the program and build the massive map i want to build, my work is just to busy. I’d like to just tweak an existing map to make the work a lot less intensive. You cannot uncook a map from the website. The map creator cooks the map so that the file is smaller and so that their creation is protected from being tweaked by others. There are too many hours invested into each map creation and cooking the map is the only type of “copyright” protection a map creator has to just let anyone modify it. You could always use the map generator feature of the map editor and then tweak what the map editor generates to your own desire. You can always use the Map Editor and show us all how it’s done.